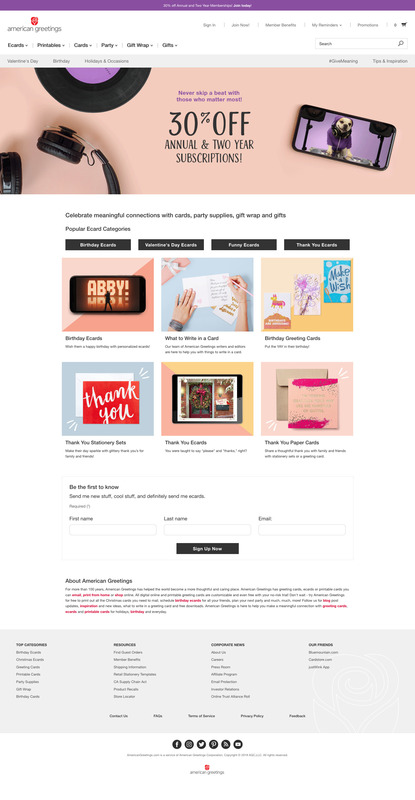 The goal of the American Greetings website is to help users create and sustain meaningful connections throughout their lives. 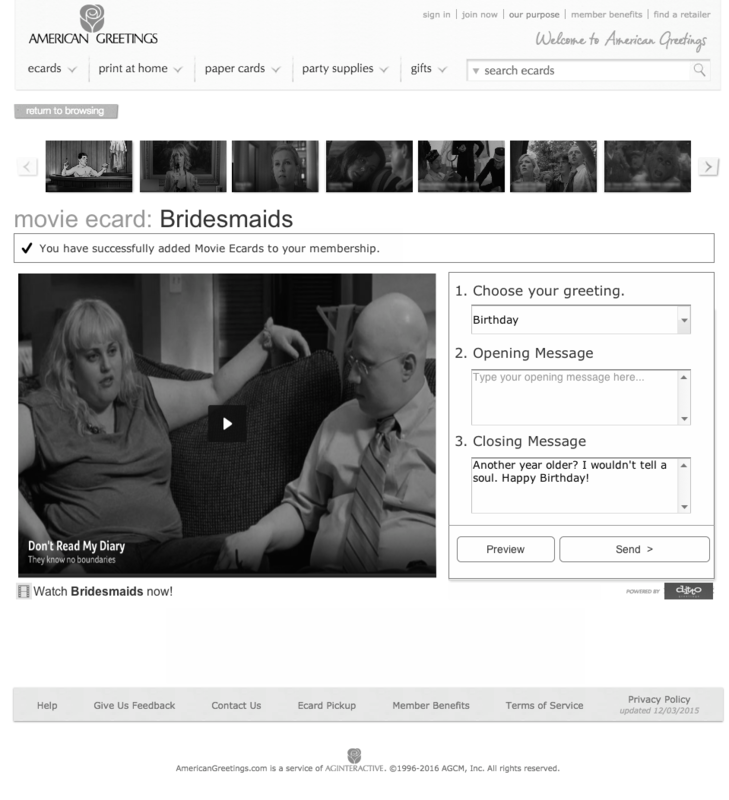 American Greetings regularly partnered with massive media entities and well-known television stars to help them achieve their goal. 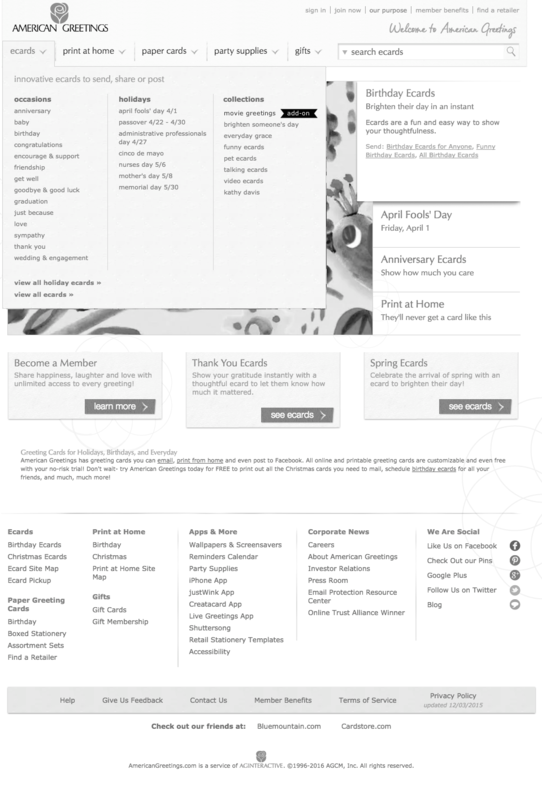 The digital side of the American Greetings business was sustained through recurring subscription revenue from several brands under the American Greetings Corporate umbrella. 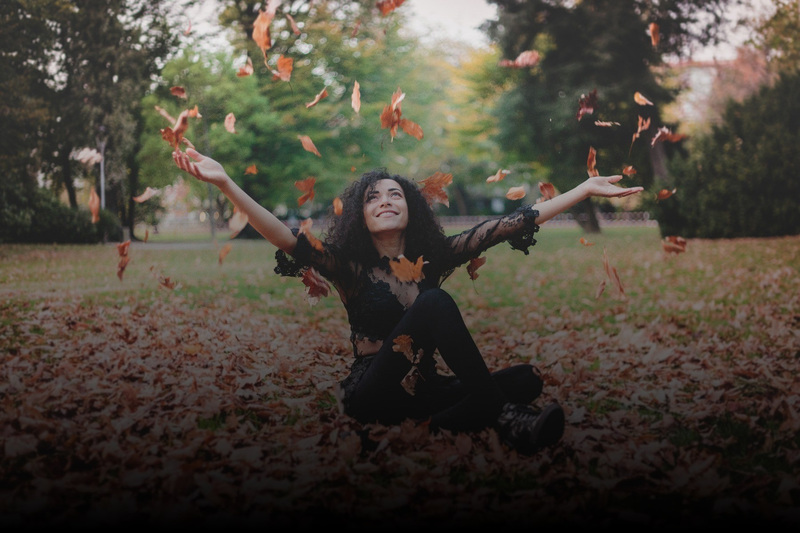 Subscription revenue in the digital greeting card industry was being lost to gifs, memes, and other free content around the web. 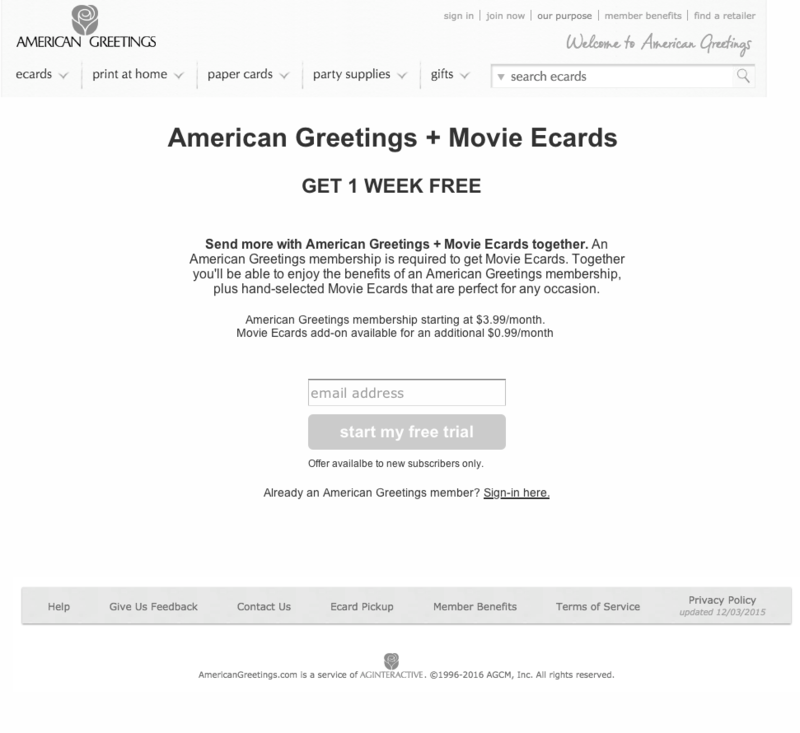 American Greetings wanted to boost their recurring subscription revenue by introducing an add-on subscription that consisted of relatable and funny movie and television content. This was to be achieved by partnering with another digital media service provider. 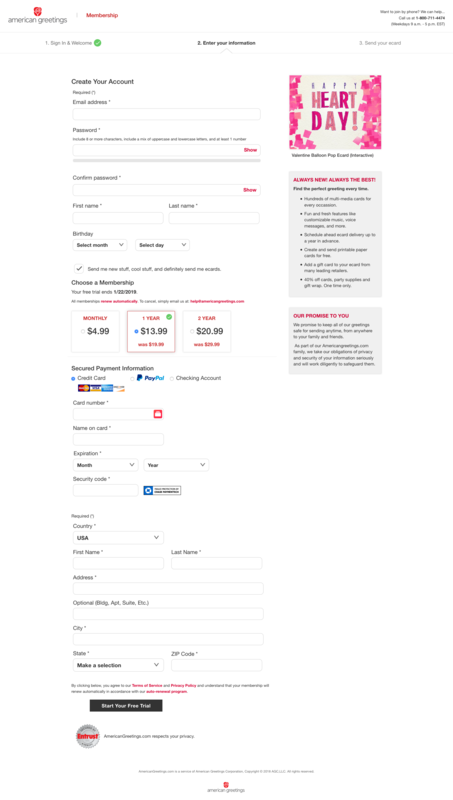 We needed to create a template for integrating a media partner in to the American Greetings experience as an add-on subscription. This template was to be used for this project, as well as other media partners in the future. To get a good understanding of the problem space, we decided to conduct a thorough competitive analysis to better understand how industry leaders were handling add-on subscriptions. We also took part in organizing 5, 60-minute 1-on-1 remote user research sessions to better understand the needs and desires of our users. We also wanted to gauge their interest in the new movie and television content. The long withstanding target demographic for this content was technologically-savvy and highly social women between the ages of 50-75. With the introduction of media content, stakeholders believed that we could also include men with similar characteristics in our target demographic. This notion, however, needed to be backed up with additional user research. 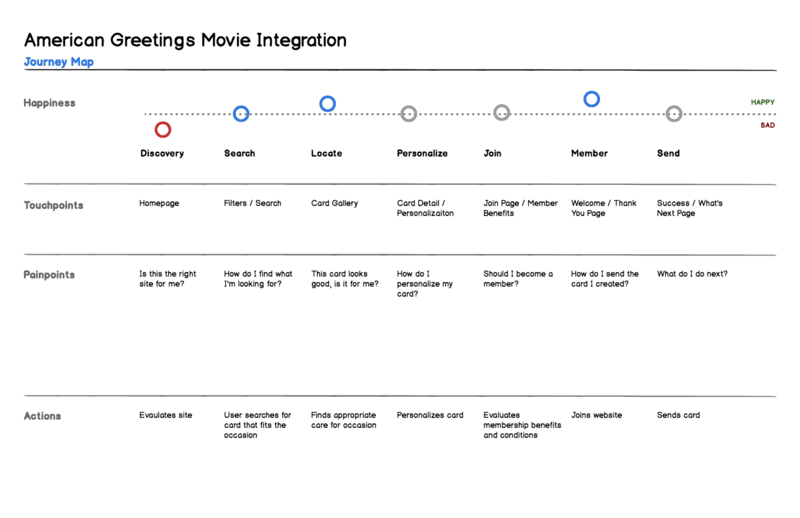 We created a journey map to better understand our users' emotions throughout their journey. Focusing on the emotions throughout the journey would allow us to minimize negative experiences. We created early sketches to help the team envision our preliminary experience. We then used this basic experience to get feedback. 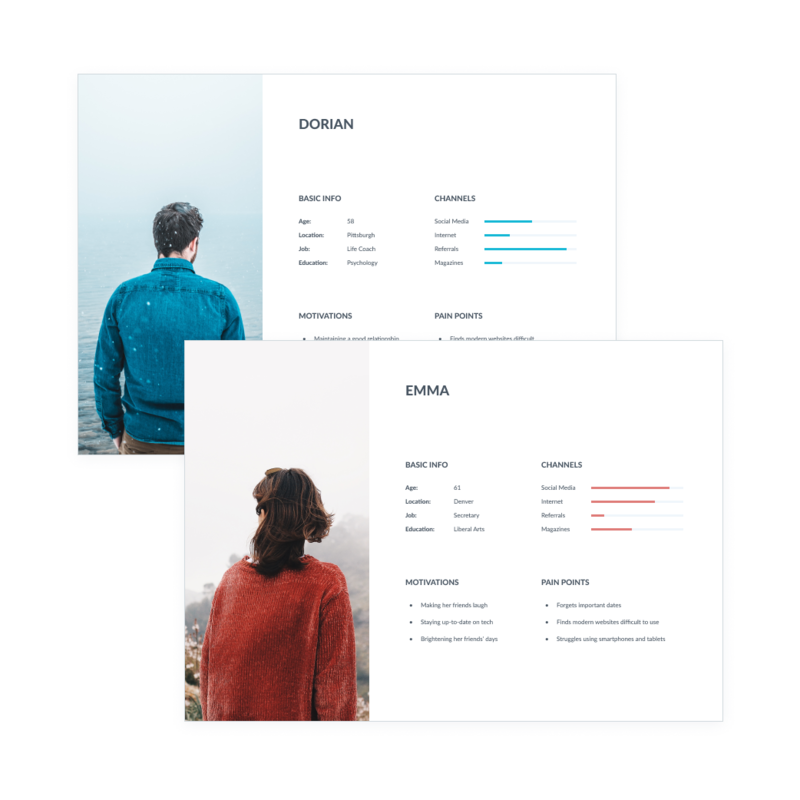 The goal of our first round of testing was to understand our users expectations when signing up for an add-on subscription, and the actions they take when sending a digital greeting card. Positive feedback would ensure that we were moving in the right direction. I created mid-fidelity to perform more testing and get additional feedback. I addressed early concerns regarding value proposition and content framing. 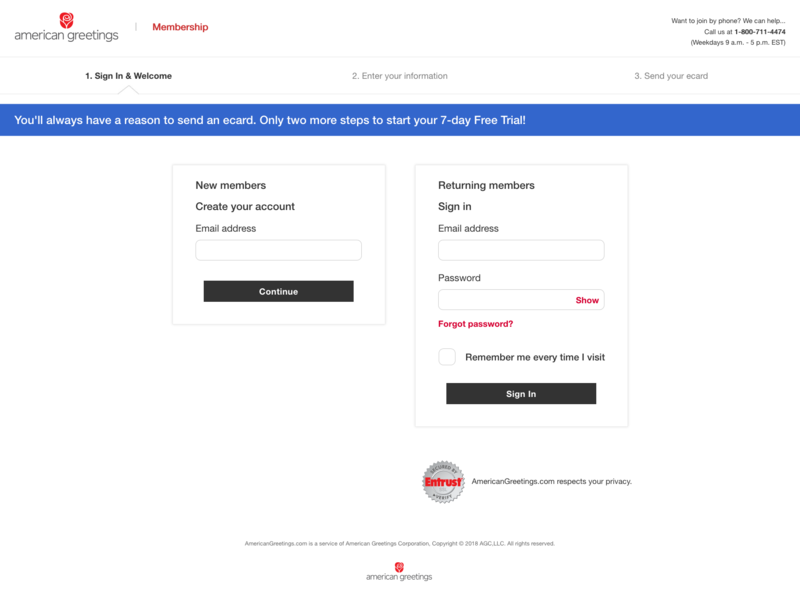 During our second round of testing, we wanted to test if we made the value proposition of the additional subscription more clear. 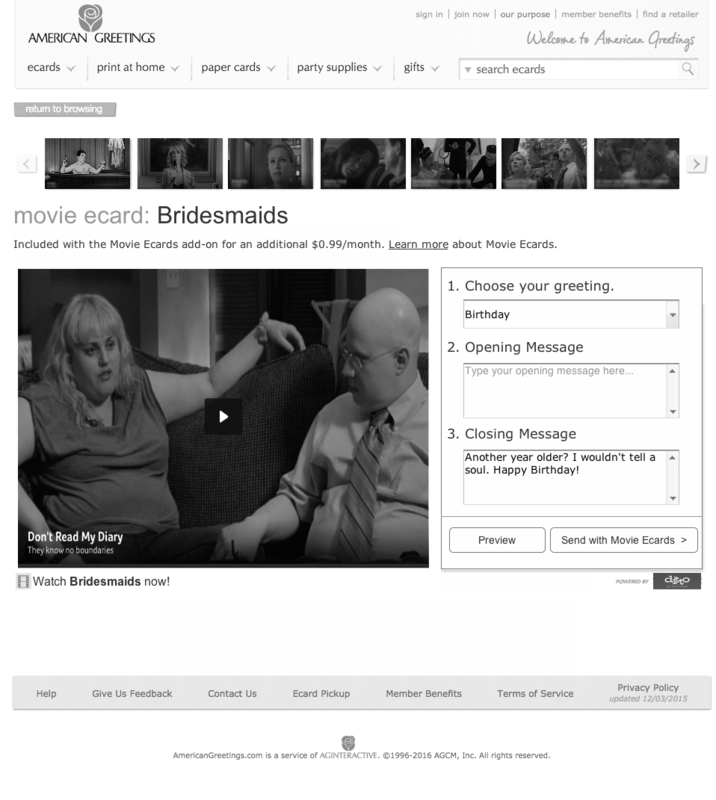 We also wanted to see how additional media content landed with our users. 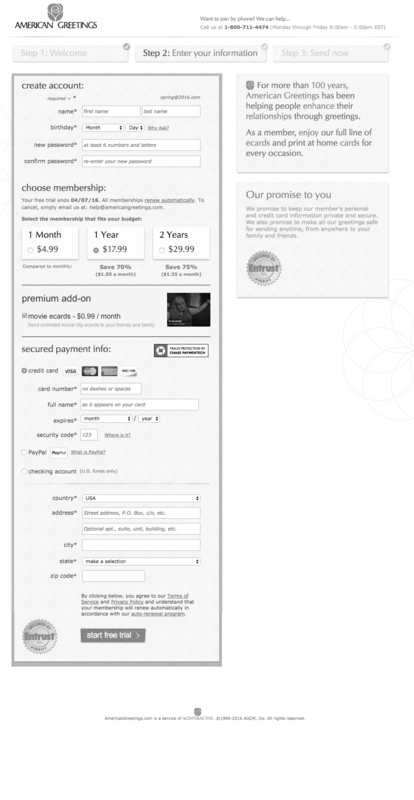 We were able to effectively build an MVP for including an add-on subscription to our current subscription tier. 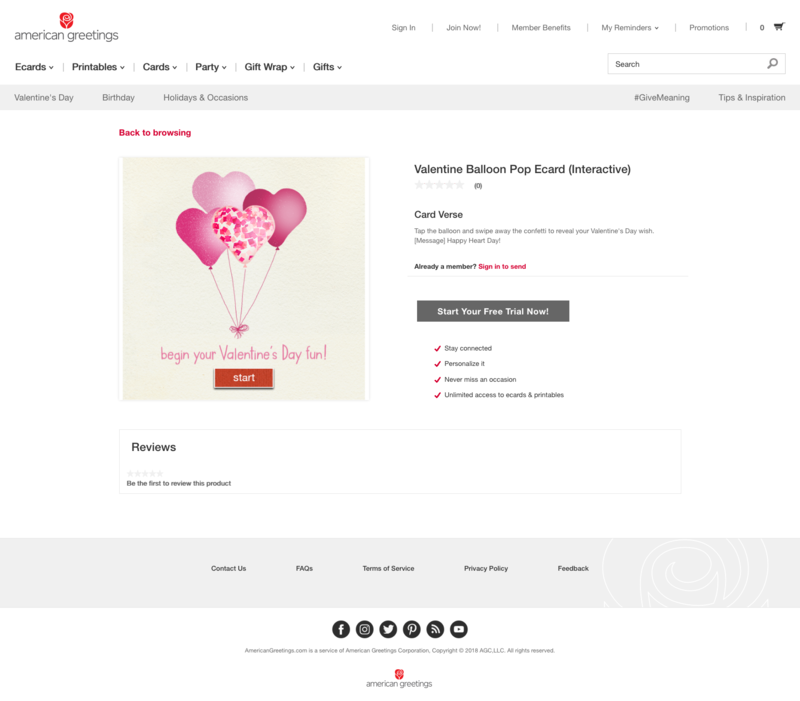 This add-on content gave American Greetings the ability to partner with a wealth of media partners in the future. This template was tested, and would continue to be iterated on after launch. The add-on subscription model will continue to be evaluated with various media partners in the future. Weâ€™ll need to keep a close eye on incoming user feedback and continue to observe users signing up for subscriptions.